Waiting their turn in the ground. I am an accidental gardener. I don’t really make plans, I just go with the flow. A few years ago when I tried doing a square foot garden, it made me uncomfortable. I was happy when the plants ran wild and didn’t stay in their allotted space. Except the tomatoes, they were very orderly. No one budged outside their square. Of course they were scrawny and puny, so that helped. The hazards of growing tomatoes in Wyoming. Sometimes the weather makes you plant late. Then the weather on the other end makes you pick early, or lose your crop. Or it gets wiped out by hail. Or locusts, or some other Biblical sized plague. Roma tomatoes, of course. Cherry tomatoes, Better Boys, Early Girls, Beefsteak, and some Black Krims a fellow customer assured me were delicious. After my last undersized crop, I wanted to make sure I get some kind of tomatoes this year. My instincts were to plant just Roma tomatoes and go for an all-out sauce canning session in the fall. But one cannot live on sauce alone. I do like a nice slice of tomato with a pinch of sea salt, and maybe some olive oil and vinegar on it. I’m sure if I get bumper crops of tomatoes, someone will step up and help me eat them. Cherry tomatoes are already earmarked for the grand kids. Easy to pick and stuff in your mouth while still sun warm. The only other interesting thing I’m planting is cabbage, in hopes I get enough to do a big batch of sauerkraut in the fall. Who knows what other vegetables will fall into the fermenting crock? Hence the need to cut back on planting and growing my own. Then I’d need to buy more canning jars and lids and crocks and…. You see where this is going. In the spirit of self-restraint, I’m trying to rein in my desire to Plant-All-The-Things! On the other hand, the Farmer’s Market opens soon. Pickled green beans here I come! 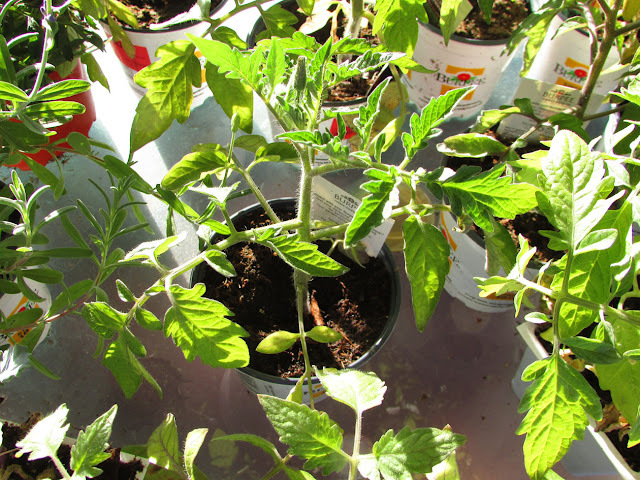 I got 4 tomato plants (and some onions) in the ground on May 3, my earliest start ever.They are now flowering. Will be eating early this year! Just planted some peppers, and a "salad" plant. Also some catnip....Gunther needs his supply. A little space left....have to decide on something, swiss chard maybe?